'Avatar' was the most visually spectacular film of 2009. It was also the most profitable, breaking the record for highest grossing film of all time. 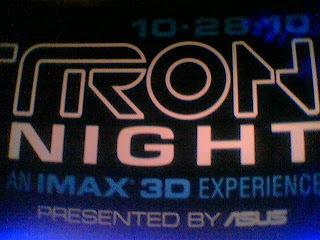 A part of that success is down to the amount of hype it manage to generate, and it was with that in mind that Disney organized Tron Night. 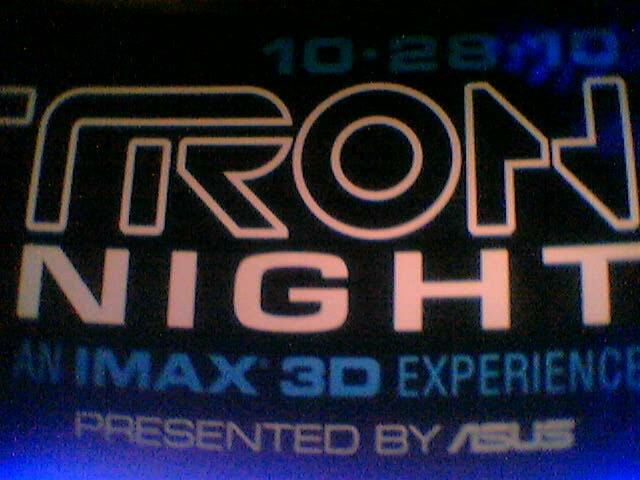 Like 20th Century Fox's "Avatar Day", Tron Night served as a an appetiser of upcoming delights. Free tickets were issued on DisneyScreenings.com for select cinemas across the UK. I was lucky enough to get a ticket for the BFI IMAX in London, and was treated to a 23-minute sneak preview of 'Tron: Legacy'. When I first heard that they were making 'Tron: Legacy', I was concerned. After all, the original 'Tron' was absolutely groundbreaking. Nobody had seen anything like it before, and its impact was huge. It inspired John Lasseter to go into CGI and eventually make a little movie called 'Toy Story'. That was back when CGI had yet to become the phenomenon that it is today. Much time has passed and now CGI is not only commonplace - it is pretty much *expected*. My initial feeling was that CGI had reached a plateau, and that it would be impossible for 'Tron: Legacy' to pack the same punch as its predecessor. Well, 'Tron: Legacy' certainly looks very, very good. Saam said as much when he went to the world premiere of the trailer back in February. This is one stunning picture, but not the same sort of stunning that 'Avatar' had to offer with its barrage of primary colours. The world of Tron is stunning because of its minimalist, stylised nature. There are vast expanses of dark space, punctuated by lines of bright colours, the contrast of which creates breathtaking imagery. The trailers have already shown some of these images, but what they don't show is how good they look when things really come to life. The Disc Battles and Light Cycle races from the original 'Tron' make a spectacular return, but with the enhanced visuals and the physicality of today's filmmaking. The CGI, which has come so far since 1982, gives us action that has never been so mesmerising. One thing that surprised me was just how great the movie sounds. Much effort has been put into making everything sound just right. The Program characters of the cyber world speak with highly synthesised voices. From the whoosh and hum of passing Light Cycles to the static crackling of the Disc Battles, the soundtrack is a richly textured canvas of sound effects that wouldn't be out of place in either 'Star Trek' or 'Star Wars'. There has been a lot of speculation surrounding the score by electronic duo Daft Punk. I had reservations about this, because Daft Punk had never composed a score before. I am pleased to say that I was wrong, and that the score sounds magnificent. There are phrases of the robotic Euro-disco rhythm that Daft Punk are famous for, yet there are segments of percussive ambience reminiscent of Hans Zimmer's work in 'The Last Samurai' and 'Inception'. At this point, it is unclear if the movie will be as much of a "game-changer" as its predecessor. Seeing as it doesn't demonstrate some sort of new technology, it probably won't. Even the 3D, which seems to be a big deal these days, is unnecessary. One thing is certain though: regardless of its potential for cultural or technological impact, 'Tron: Legacy' promises to be an audio-visual feast that holds its own against the likes of 'Avatar'. 'Tron: Legacy' is out in the UK on December 26th, preceded by the US release on December 17th.